Your scuba certification begins when you come in and purchase your student materials. We refer to this as your “crew-pack” and it includes your textbook, a supplemental text called “how to use and choose dive computers,” your student folder, logbook, and a video. Student materials cost about $145 and will serve as your self-study component for the class. Each week when we meet for class, we will review the knowledge reviews at the end of each chapter which you will have completed prior to class. Tuition is $699 for the full open water diver certification, or $399 for the referral portion. A referral is where you will complete the class and pool sessions here in Alaska, but the open water dives elsewhere. This is perfect for divers who might have a tropical vacation planned. For all those divers brave enough to truly dive Alaska, we offer an upgrade to dry suit certification for $99. This is normally a $300 course, and is a specialty PADI certification. 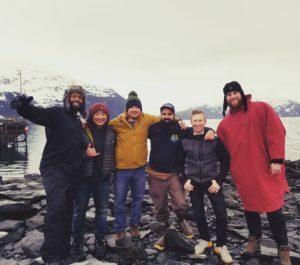 The $99 covers rental, fitting, and pool training in a dry suit, as well as the necessary certification dives in Whittier. This deal is only valid for Dive Alaska’s current open water students. Please note, these prices cover tuition and gear rentals; it does not include the PADI course materials students are required to own (crew-pack, etc.). To enroll in a Dive Alaska class, the very first thing you need to do is come in and fill out a student folder (even for e-learning). This allows us to put you on the class roster and answer any questions or concerns you might have. This is also a good time to pick up your crew pack so you can be ready for your first day of class. Between the time when you fill out your student folder and pick up course materials, and when class begins, you will come into the shop and select your personal gear. These items include mask, snorkel, booties and fins. For budgeting purposes, we estimate these items to cost approximately $300 depending on make and model. If you would like to finish your certification elsewhere, you will complete e-learning (use button on the left to purchase course), the practical “hands-on” classroom training, and the pool sessions, here. Then we will send you away with the necessary paperwork to be received by a PADI instructor at your destination. The instructor will complete your open water dives with you and issue the certification. Eazy-peazy. Would you rather participate in our in-person classroom activities? Join us for our monthly scuba classes and learn in our comfortable classroom with your dive buddies. You will begin by picking up your student materials from our shop, then reading the first chapter and watching the instructional video. In class, we will discuss the knowledge review and you will complete a short quiz. Each classroom includes a short hands-on session with the gear to preview the following pool session. Check out our calendar for upcoming PADI courses and events! Please note: If you don’t see the class you’re looking for, feel free to contact us and arrange a course that fits your schedule! We offer a huge variety of courses, and our instructors can teach every PADI speciality (and even a couple that we’ve made ourselves)! Learn the lingo. During the first phase of your PADI Open Water Diver scuba certification, you develop an understanding of the basic principles of scuba diving. You learn things like how pressure affects your body, how to choose the best scuba gear and what to consider when planning dives. You briefly review what you have studied in the five knowledge sections with your instructor and take a short quiz to be sure you are getting it. At the end of the course, you will take a longer quiz that makes sure you have all the key concepts and ideas down. You and your instructor will review anything that you do not quite get until it is clear. This is what it is all about – diving. You develop basic scuba skills by scuba diving in a pool or body of water with pool-like conditions. Here you will learn everything from setting up your scuba gear to how to easily get water out of your scuba mask without surfacing. You will also practice some emergency skills, like sharing air or replacing your scuba mask. Plus, you may play some games, make new friends and have a great time. There are four confined water dives, with each building upon the previous. Over the course of these four sessions, you attain the skills you need to dive in open water. 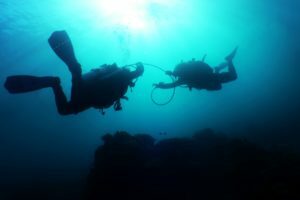 After your confined water dives, you and the new dive buddies you have made continue learning during four open water dives with your PADI Instructor at a dive site. This is where you fully experience the underwater adventure – at the beginner level, of course. You may make these dives near your home or at a more exotic destination while on a scuba vacation.